A Poll is one of the special types of Messages. It allows you to send a multiple-choice question with up to five possible answers. To create a Poll, follow the same steps as creating a basic Message. In the "What is it" section, where you write the message, select "Poll" on the left. 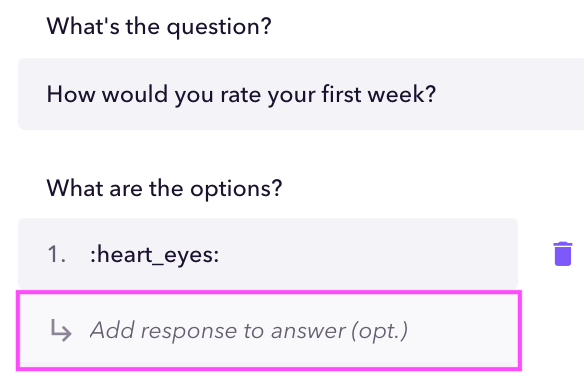 Now you have fields to put the question you want to ask and the multiple-choice answers. You'll also see options to add responses to each answer (more on "smart" responses below). By checking the "Ask for comments" box at the bottom, you can encourage recipients to submit qualitative feedback when they respond to polls. 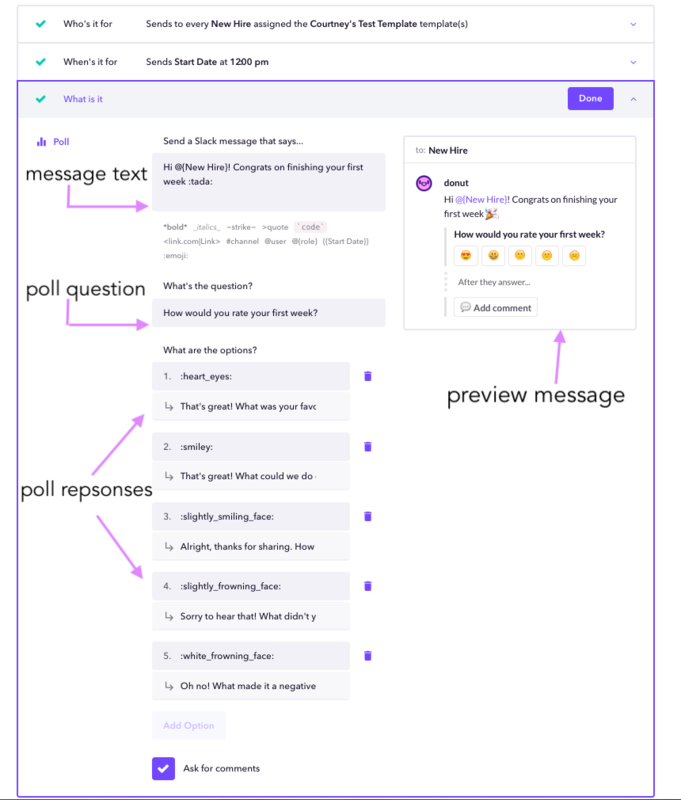 Donut will automatically nudge all poll recipients to respond, making it easier for you to collect reliable feedback from your team. When recipients don't answer, Donut will send them a reminder message each day until they complete the poll, so you don't have to. When recipients receive a poll, they have the option to snooze it for a temporary period of time. All they have to do is click the "Snooze" drop down and select how long they'd like to snooze the reminder. Donut will continue to check in until the poll has been completed. In the event that someone accidentally makes the wrong selection when responding to a Donut poll, they can simply hit the "undo" button to select a different option. Note: This will undo both the response and any additional comments! 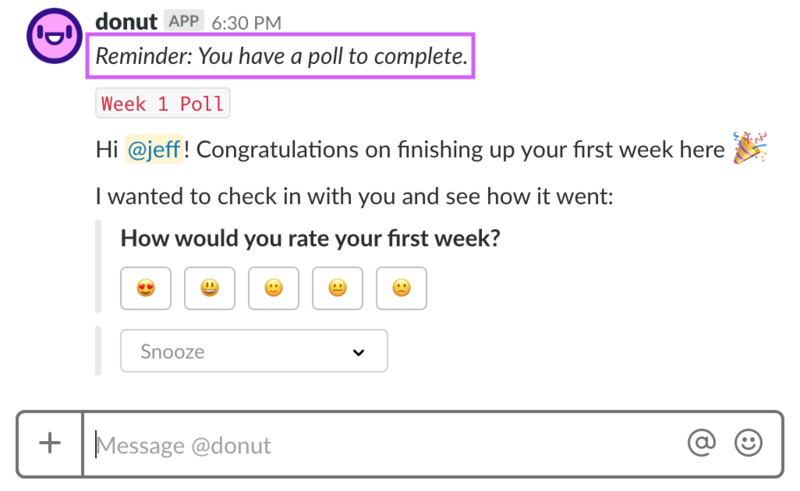 Donut's smart poll responses allow you to respond to your team's feedback with pre-programmed, customizable replies and prompts. In other words, you can create different follow-up responses from Donut for every poll answer. Once you've entered the question you want to ask and input possible responses as multiple-choice answers, you'll also have the option to input your poll responses to each answer. Click into the field below each poll answer (where it says "Add response to answer") to add responses or follow-up prompts if desired. You can also preview each smart poll response by clicking on the answers in the preview message box. This will display the follow-up smart responses as they will appear in Slack. Click "Reporting" in the left navigation. Below the overview of your team stats, you'll find specific poll responses. Hover over charts to quickly see who responded, or click on a poll to view individual responses and comments. Click "New Hires" in the left navigation. Find the new hire class (start date) whose responses you want to view and click the bar graph. You'll be taken to poll responses for only that class. Hover over charts to quickly see who responded, or click on a poll to view individual responses and comments.